DURING the operation of a drilling rig the Shale Shaker House serves as an area where immediately upon return from the borehole the drilling mud undergoes reconditioning in preparation for recirculation. Drilling mud is generally composed of liquids (water or oil-based) mixed with suspended, finely divided solids of various types . 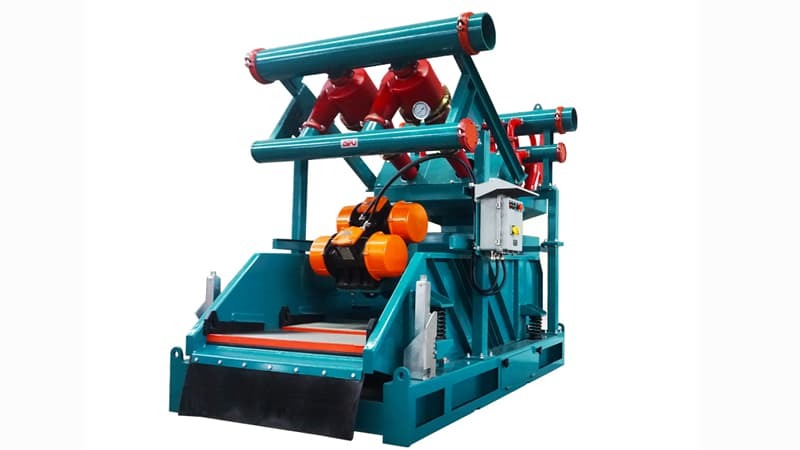 The drilling mud has several functions, among which are to cool and lubricate the drill bit and to serve as a transport medium for materials cut loose in the borehole. In the Shale Shaker House materials such as swarf (cuttings), sand and gas are removed from the circulating mud at open shale shakers (vibrating screens), mud cleaners (cyclones) and degassers before the mud returns to the storage tanks ready for recirculation. After returning from the borehole, the mud may have reached temperatures as high as 50-60°C; in the case of water-based mud this causes the air in the Shale Shaker House to become very humid (85-95%) with drops of mud, aerosols and dust. If it is oil-based, toxic organic vapors may also be present. As the Shale Shaker House is also an area in which rig personnel collect samples of cuttings and drilling mud for analyses at frequent intervals, the content of particles and vapors in the atmosphere should not be ignored but the occupational hygienic aspects of the use of drilling fluids should be seriously addressed; this is especially true when toxic substances are used as additives or are otherwise present in the mud. Regarding the use of oil-based drilling fluids, the occupational hygienic aspects have recently been studied and exposure limits for oil vapors suggested, while the aspects of using water-based and inorganic drilling fluids have not previously been addressed. In this paper we describe a study of airborne dust sampled in the Shale Shaker House on a drilling rig during 20 h of offshore operation in the North Sea. A water-based alkaline drilling fluid containing mainly barite (BaSO4) and minor amounts of other additives was used. No direct source of hydrocarbon emission was present, and the work was undertaken to determine the concentration of airborne dust in the Shale Shaker House during drilling operations and to analyze the collected dust for elemental composition in order to obtain preliminary information on the concentration profiles within this specific working area. PIXE (proton-induced X-ray emission) and ICP-MS (inductively coupled plasma-mass spectrometry) were chosen as supplementary multi-element analytical techniques. The drilling took place in the Danish part of the North Sea, at 56° N. lat., 03° E. long., on the Maersk Guardian drilling rig, and at a depth of approximately 5000 m. The drilling mud used was composed of an alkaline water slurry of BaSO4 together with, among other additives, chrome lignosulphonate and chrome lignite; the slurry was adjusted to about pH 10 with sodium carbonate (Na2CO3). The chrome additives were used from a drilling depth of about 4500 m.
Three different locations in the Shale Shaker House (dimensions: approximately 18 x 8 x 3.5 m) were chosen for the sampling of airborne dust: at the working place, at the mud cleaners and in front of the open shale shakers. The working place for rig personnel was located near the fresh air intake, in the farthest corner of the room away from the shale shakers. Here rig personnel analyze samples of drilling mud collected at the outflow from the shale shakers every 15 min. Millipore cellulose acetate filters, type RWWP, of diameter 50 mm and pore size 1.2 fim, were used for collecting the airborne dust samples. The filters were mounted in a sampling head consisting of a filter support and an air intake funnel. The sampling heads were stationary and placed vertically, with the aperture downwards, at approximately head level. The funnel was twice as long as its diameter of 42 mm. Flow rates of 2-4 m3 h ~”!, corresponding to suction speeds of 0.4-0.8 m s ” ‘ , were obtained by pump units consisting of the pump, a constant flow regulation device, a flow-meter and gas volume-meter. Sampling periods varied from 2 to 4 h.
The total amount of dust collected onto each filter was determined as the weight difference between the preconditioned blank filter and the conditioned exposed filter. PIXE analyses. 2- and 3-MeV protons generated by a van de Graaff particle accelerator were used for the analyses. Two areas, total 1 cm2, were analyzed on each filter. The areas chosen lay opposite to each other between the centre and edge. The mean measured amounts of elements collected on both areas were calculated and extrapolated to estimate the total amount collected on the entire filter. Blank filter values showed that no background correction was necessary. Only elements of atomic weight 27 (aluminum, Al) and higher could be measured. ICP-MS analyses. A PlasmaQuad from VG Elemental was used for the analyses. Two opposing circle sectors of 45° of the filters corresponding to a quarter of a filter which had not been irradiated during the PIXE analysis were cut out and digested/dissolved in concentrated nitric acid (HNO3), using the microwave technique. The dissolved samples were diluted with water to 15 ml; 2 ml were then taken out, neutralized with ammonia (NH4OH)and measured semi-quantitatively using indium (In) as an internal standard. Furthermore, the contents of barium (Ba) and of chromium (Cr) were determined quantitatively by the isotope dilution technique by adding the stable isotopes Ba and Cr to the solutions. Because of large differences in the content of Ba and Cr in the samples, independent measurements were performed. All the 16 filters used for sampling of dust in the Shale Shaker House are listed in Table 1. Location, exposure time, amount collected and concentration of dust are given. Filters 1, 2 and 4 were exposed during periods when no drilling but only circulation of mud took place, while all of the remaining filters were exposed during drilling periods. The concentration of dust is relatively constant (about 1 mg m~3) at the open shale shakers; it varies but is lower at the mud cleaners and still lower at the working place, as shown in Fig. 1. The high concentration of dust found on filter 4 (3.22 mgm”3 ) is probably due to splashes of mud, as an unsuitable sampling position was chosen for that particular measurement. The results of the PIXE analyses are given in Table 2. As Al was the element with the lowest atomic mass which could be measured no values were obtained for the amount of carbon (C), nitrogen (N), oxygen (O) and the cations sodium (Na) and magnesium (Mg). Besides, Cr was difficult to detect as the signal interfered with Ba. In addition to the PIXE analyses, semi-quantitative ICP-MS analyses were also performed as it gave values for some of the elements which could not be detected by PIXE, e.g. boron (B), Mg and Cr. As none of these elements are present in significant amounts and as the results obtained for other elements are comparable with those found by PIXE, the ICP-MS values are unlisted. However, the results of the quantitative ICP-MS analyses of Cr and Ba using the isotope dilution technique are given in Table 2. The sum of the amounts of elements found in the samples by the PIXE analyses provides an estimate of the total amount on the filters. However, this sum has to be corrected for contributions from elements which could not be detected, e.g. oxygen bound to sulphur (S) and silicon (Si) before it can be compared with the total amount obtained by weighing; this contribution may increase the sum by up to 60%. Carbonaceous particles may also contribute to the total amount. The uncertainty of the PIXE measurements is estimated to be about 10%, increasing with increasing amounts of dust on the filters due to matrix interferences. FIG. 1. Concentration profiles. Concentration of the total amount of dust (total, • ) in the atmosphere of the Shale Shaker House plotted vs the filter number (time-dependent, cf. Table 1). Also shown is the concentration of the 10 most abundant elements together with Cr in the collected dust as measured by PIXE or ICP-MS (Cr, O). The values for Ba ( • ) are the means of the PIXE and the ICP-MS measurements. Figure 1 shows the concentration profiles for the total amount of dust, and for the 10 most abundant elements and Cr analyzed by PIXE and ICP-MS in dust from the three different sampling locations. Ba is the single most abundant element, with other elements (mainly: Al, Si, S, Cl, K, Ca and Fe) present in considerably lower concentrations. While the presence of Al and Si may indicate that mineral matter (silicates) contributes to dust level, K, Ca and Fe may also be present as carbonates. The major part of the collected dust particles probably consists of BaSO4 from the mud: the content of Ba in the particles is seen to be closely correlated with the total amount of dust on the filters, and the ratio of Ba to S corresponds to the stoichio-metric ratio in BaSO4, i.e. 4.28. Apart from filter 4, the highest concentrations of Ba observed are about 0.2-0.3 mg m~3 for filter Nos 10, 12, 13 and 16. This level corresponds to about 0.4-0.5 ragm”3 BaSO4, which in turn can account for up to half of the total amount collected. A further indication of the close correlation that exists between the collected dust and drilling mud is given by the concentration of Cr as analyzed by ICP-MS. In this particular case, where chrome additives are present in the mud, Cr can be used as a tracer compound for the source of dust. At the shale shakers and mud cleaners some Cr is observed,0.6-2.2μg M-3 (TLVforCrvl: 50 n% m~3; ), corresponding to 0.4-0.5% of the amount of Ba. This may be compared to the content of 0.3-0.4% Cr relative to Ba found in different samples of drilling mud collected at the outflow from the shale shakers during the operation. The correlation between the concentrations of Ba and Cr in dust on individual filters from the mud cleaners and the shale shakers can be seen in Fig. 1. The highest concentrations of dust were found at the open shale shakers with a time-weighted average of approximately 1 mgm~3; this is higher than that at the working place (0.23 mg m–3) by a factor of 5 and, when filter 4 is neglected, higher than that at the mud cleaners (0.49 mg m–3) by a factor of 2. 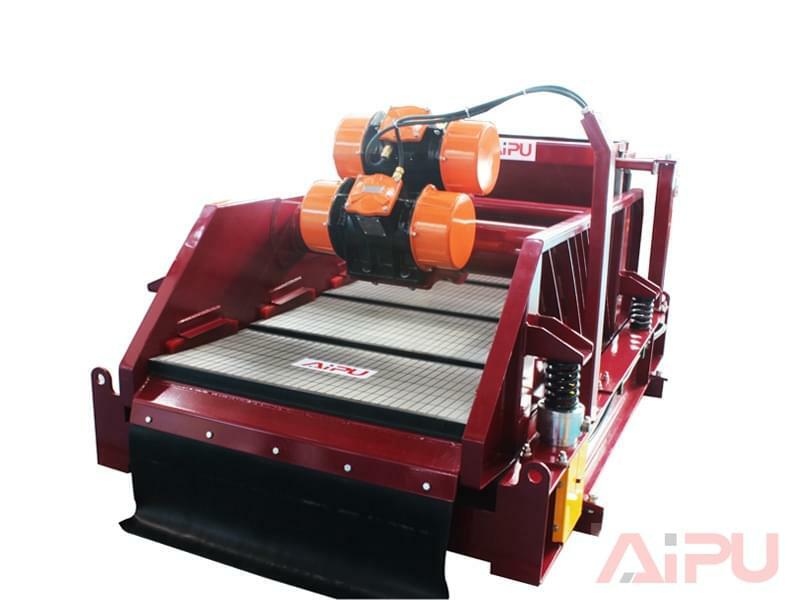 Hence, the open shale shakers with their vibrating screens are probably responsible for most of the generation of dust and the higher concentration observed there. In a recent study of the effects of oil-based mud the highest concentrations of oil mist and vapors were also observed near the open shale shakers. The lower concentration of particles observed at the working place is probably mainly an effect of its greater distance from the open shale shakers. The relatively high value of chlorine (Cl) compared with the total amount of dust, especially for filters 2,7 and 8, may indicate the presence of marine aerosols probably coming from the fresh air intake located there. The concentrations of individual elements are comparable with those measured recently in aerosols collected elsewhere in the North Sea (BRUYNSEELS et al., 1988). Furthermore, preliminary instrumental neutron activation analyses (INAA) of the filters from the working place yield a ratio of Cl to Na corresponding to the stoichio-metric ratio in sodium chloride (NaCl) (HANSEN et al., ‘ICP-MS, INAA and PIXE analyses of air-borne dust samples’, to be published). On the contrary, it is difficult to explain the high concentration of dust on filter 11, which is considerably higher than for the other samples from the working place; the sum of the PIXE results for filter 11 indicates that the total amount collected should be much lower. In summary, the concentration of airborne dust in the Shale Shaker House during an offshore drilling operation was shown to be well above the background. The concentration profile of dust in the atmosphere was strongly dependent on the distance from the open shale shakers and to a lesser extent on the fresh air circulation in the room; the highest concentration was observed at the shale shakers. The elemental composition of the dust particles collected at the mud cleaners and the shale shakers showed highest amounts of Ba, Si and S as analysed by PIXE and ICP-MS. Hence, BaSO4, the main constituent of the drilling mud, was probably the major source of dust in the room, open shale shakers being responsible for the generation of dust.